H. Joon Kim, MD, is an assistant professor in the section of Oculplastics, Orbital and Cosmetic surgery, who has been with the Emory Eye Center since 2010. She specializes in the medical and surgical management of both adults and children with eyelid, eye socket, and tear duct problems. She provides patient care at Emory Eye Center, Emory Midtown, Emory at St. Joseph Hospital, and Children’s Hospital of Atlanta at Egleston. She also greatly enjoys teaching residents and fellows at the Atlanta VA Medical Center and Grady Memorial Hospital. She is a team physicians for the Atlanta Hawks professional basketball team. Dr. Kim contributes significantly with her research that focuses on various surgical techniques, orbital conditions, and challenging pediatric conditions. 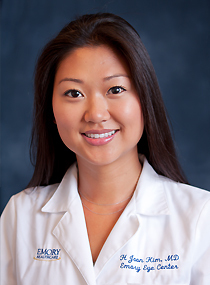 Dr. Kim is board certified in ophthalmology by the American Board of Ophthalmology. She is a member of the American Academy of Ophthalmology (AAO) and the American Medical Association (AMA). She has published numerous articles and book chapters in peer-reviewed publications and has presented at national and international meetings.